The Provincial Competitiveness Index (PCI) is a gauge drawing much interest from localities and investors. However, in recent years, PCI rankings of Binh Phuoc province continuously decreased, from 35th (57.47 points) in 2013 to 38th (57.79 points) in 2014, 54th place (56.41 points) 2015 and 57th (56.21 points) in 2016. This has posed major challenges to reform and improve the business environment in general and PCI in particular. 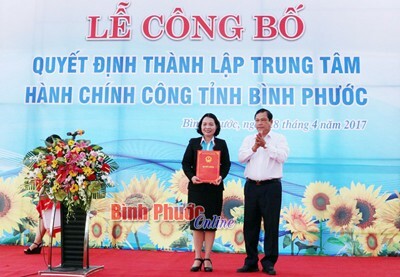 Frankly looking back on these poor performances, the Department of Planning and Investment of Binh Phuoc province admitted that PCI Indexes in recent years showed that local enterprises dissatisfied with the working quality of State employees, administrative procedures remain complex and business confidence in business support services is not as high as expected. Mr Vo Sa, Director of the Binh Phuoc Department of Planning and Investment, said, that reality is potentially resulted from insufficient awareness of PCI contents and roles as well as inadequate responsibility of leaders of departments and districts/towns. The coordination among provincial agencies with districts/towns is not very good, leading to the overall underperformance. Some State employees still show attitudes of bureaucracy to enterprises. Moreover, the scattered location, ineffective operation of administrative bodies in the province make their roles of supporting and providing administrative services for enterprises like investment incentive support, legal support, market and business partner information, personnel training and recruitment. To stop the losing trend of PCI and lift it up, the Department of Planning and Investment will advise the Provincial People’s Committee to build plans, regulate and deploy solutions to improve the following indicators. - Market entry costs: Strengthening coordination among agencies to apply the one-place single-window mechanism for business registration and business conditions in order to shorten the time and reduce nuisances for enterprises, timely solving problems for businesses and strengthening inspections after investors fulfil business registration. - Transparency and access to information: Strengthening openness and transparency of the State's policies, laws, plans and projects in many forms; raising the quality and regularly update information on websites of the Provincial People’s Committee, provincial departments, and districts/towns. - Time costs and regulatory compliance: Strictly complying with the regulations of the Provincial People’s Committee on preferential policies and procedural processes and time costs; regularly reviewing administrative procedures, promptly detecting inappropriate administrative procedures to recommend relevant bodies to adjust accordingly, reducing the time for settling administrative procedures; improving the role of the Provincial Inspectorate in coordinating inspections and examinations over the settlement of administrative procedures provided by State bodies order to reduce time costs for enterprises. - Informal charges: Executing inspection and supervision plans in the following areas: citizen reception; complaint and denunciation settlement, anti-corruption; effectively implementing regulations on official ethics, strictly handling acts of harassment and bureaucracy. - Policy bias: reviewing existing policies and updating new policies of the central government; being transparent in enforcing business support policies; ensuring equality among businesses of different economic sectors. - Proactivity of provincial leadership: Proactively and flexibly performing administrative duties to create a favourable business environment for enterprises; promptly solving arising issues and unclear matters in the State's decisions and policies. All policies and decision of the state must be fully carried out by all agencies and localities. - Business support services: Strengthening the coordination and resolution to existing and emerging obstacles for enterprises; gradually socialising and privatising public services; streamlining public non-business units in order to operate more effectively. - Labour and training: Efficiently carrying out projects on high-quality human resources training and raising training quality of vocational schools and centres based on market employment demands; connecting and supporting enterprises in training and recruitment; encouraging the socialisation and privatisation of vocational training, job placement services, gradually building the labour market. - Legal institutions: Strengthening State management over construction, inspection, review and monitoring of law enforcement, raising the quality of social and economic feasibility and effectiveness; ensuring consistency of the national legal system and international commitments. Courts at all levels concentrate on settling disputes of economic contracts filed by enterprises; strictly punishing State employees committing corruption and having acts of harassment in order to build up the trust of businesses. With 10 solutions that the Department of Planning and Investment has proposed, the investment and business climate and PCI Index of Binh Phuoc province will be certainly improved.